What’s the Best Science Fiction Novel You’ve Read This Year? John Scalzi is one of my favorite sci-fi authors. He has the remarkable ability to introduce a new alien race and describe–within just a few pages of plot, not exposition–a huge amount of detail regarding what makes that race unique, special, and interesting. 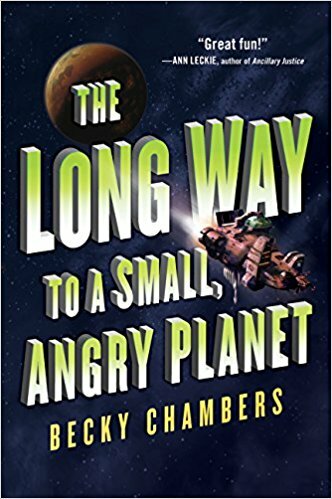 Becky Chambers, author of The Long Way to a Small, Angry Planet, accomplishes this lofty goal and takes it a step further: She makes you care about the aliens you meet. Well, most of them. Some are just rude. I’m in awe of how good this book is. After it was recommended to me, I took one look at the cover and, yes, I judged it. There’s nothing wrong with the cover, but for some reason it indicated that the book would be silly. That it wasn’t taking itself seriously. I like serious sci-fi: The Expanse, Seveneves, Hyperion, etc. But I was wrong about it being silly. It’s fun, but it’s not silly. The science, themes, and relationships have a huge amount of depth to them. But the characters–primarily crew members of a ship called the Wayfarer–have fun at all the right times (and sometimes the wrong times). One of the wonders of this book is that the plot moves forward, but it’s far from the most important part of the book. It’s not a series of cliffhangers. Rather, it’s heavily character driven. This works because the characters are likable, interesting, nuanced, and, as I mentioned early, often not human. It’s not the type of book that I could ruin with spoilers in the traditional sense, but if you’re intrigued, I’d highly recommend that you stop reading this blog entry now. But if you want a little taste of the types of aliens you get to know, here’s an example you’ll learn about early in the book. Earlier this week, I posted an article about interstellar travel. The Wayfarer is a special type of ship that punches holes in space-time to create vast highways across the universe. To accomplish this, they need to be able to view space-time in a way that humans and even the most AI can’t…but one of the crew members, an alien named Ohan, is able to do that thanks to a parasite that lives inside his brain. His alien race reveres the parasite to the point that once it took hold of his brain, he started referring to himself as “they” instead of “him.” Ohan is referred to as a plural entity throughout the book. That’s really just the smallest taste of the creativity Chambers exudes in this book. I highly, highly recommend it, and I’d love to know what you think if you try it. This entry was posted on Wednesday, September 13th, 2017 at 11:00 pm	and is filed under books and tagged with books. You can follow any responses to this entry through the RSS 2.0 feed. This year, the best sci-fi I’ve read is probably We Are Legion – We Are Bob by Dennis E. Taylor. Other enjoyable sci-fi from this year include Run Program by Scott Meyer, the Super Powered series by Drew Hayes, and The Land (Chaos Seed series) by Aleron Kong, although it’s more fantasy than sci-fi and reads like a RPG. Speaking of Scalzi, I’m certain you’ve read his Redshirts book? If not, it’s a great satire and tribute to the original Star Trek and a fun read. Eric: I’ve read Redshirts, but all of the others are new to me. I’ll go get some samples for my Kindle! On the Amazon.co.uk page it has a different cover which is more “serious”. Interesting. Louisa: I noticed that, and while I like it, it doesn’t seem to fit the book. So much of the book is spent inside the Wayfarer that it seemed a bit odd to show someone looking up at the sky from the ground. On The Edge of Gone, by Corinne Duyvis – A young adult coming of age post apocalypse (meteor strike, specifically) novel that released last year, staring a young autistic woman, and predominantly focused on her relationship with her mother and missing sister, as she tries to find her sister and secure the three of them a place on the last generational interstellar starship. And it is absolutely wonderful. I believe it’s Duyvis’s second novel, so certainly an author to keep an eye on in the future, if this is representative of her overall quality at this early stage of her career. That sounds fascinating, Stephen! I’ve downloaded a sample. Thanks! I second the We Are Legion (We Are Bob series). Especially as you liked the Becky Chambers series (have you read #2?). Derelict Marines (and sequel Derelict Tomb) by Paul E. Cooley; Six Wakes by Mur Lafferty; Mechanical Failure by Joe Zieja; The Ark series by Patrick Tomlinson; 2140 by Kim Stanley Robinson; Freefall by Felix Savage; All Systems Red by Martha Wells; All the Birds in the Sky by Charlie Jane Anders; Every Heart A Doorway by Seanan McGuire (more fantasy but good); Dark Matter by Blake Crouch; Fortune’s Pawn (and others in the series) by Rachel Bach; Peter Grant series by Ben Aaronovitch (more fantasy but awesome); Planetfall by Emma Newman; Waking Gods by Sylvain Neuvel; Invisible Library series by Genevieve Cogman (Victorian fantasy but great); Outriders by Jay Posey; Avengers on the Moon by Allen Steele; Luna by Ian McDonald; Memoirs of Lady Trent by Marie Brennan (Victorian fantasy); The Big Sheep by Robert Kroese; Frontlines series by Marko Kloos. In my To Be Read stack: The Ghost Line; Magellan; Fifth Ward; Punch Escrow; The Life Engineered; Sea of Rust; Warcross; Asteroid Made of Dragons; Fifth Ward First Watch; The Boy on the Bridge; Soldier Girls in Action; Too Like the Lightning; Bannerless; Practical Applications for Multiverse Theory; Yesterday; How to Live Safely in a Science Fictional Universe; Flight of the Silvers; Noumenon; The Dark Net; The Cityborn; Infinite; Ninth City Burning; and more. That’s a big batch of recommendations! I’ve read Waking Gods, but the rest are new to me. If you could pick just 2 of them for me to check out, which 2 would you choose? Six Wakes and Mechanical Failure. Also read All Systems Red (it’s only a short novella). Jing: I really enjoyed The Martian too! Daniel Weir has another book coming out soon. Thanks for the blog recommendation–I’ve now subscribed to it.